Boost pedals are one of the most underutilized and overlooked tools a guitar player has at their disposal. In a world where we are constantly on the lookout for that perfect tone, we are often blinded by the complexity of some effects to when simple approach might be the right one. What Exactly Are Boost Pedals? How Are Boost Pedals Used? Is There A Such A Thing As Clean Boost? What Makes A Good Boost Pedal? Why Not Just Use An EQ Pedal? Today we are going to talk about boost pedals in detail. We have selected some of the best pedals from this category, which we think you should check out. Afterward, we will get into the story of boost pedals and how they can help you out in everyday situations. Micro Amp is among the oldest and most organic sounding boosters available. Lots of transparency, range and gain that is available on tap instantly. A legend that was there since the beginning, and still kicks strong. Model that brings lots of features and performance despite its apparent simple design. 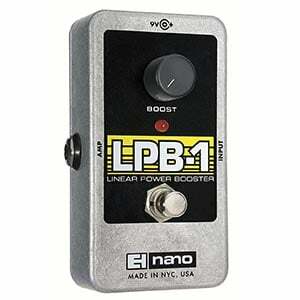 Dual purpose boutique booster pedal that delivers somewhat new and refreshing experience. This little analog beast is capable of giving you lot's of gain. Loose cannon among booster pedals that only a few handle with ease. Pure boost that is among the most transparent ones available right now. 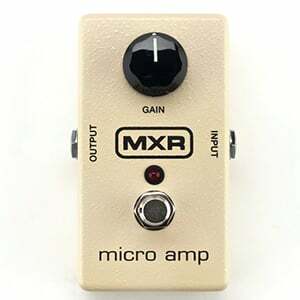 If there is one boost pedal that perfectly describes the core simplicity of this effect, it’s the MXR M133 Micro Amp. This is a pure no-nonsense device that comes in a clean package which does an excellent job at pointing you towards the one and only control knob it has, and that is Gain. There are many types of boosts to consider and this one is your meat and potatoes type. There are no bells and whistles, which is partially why this is one of the best boost pedals on the market. Hook it up to your chain, set the amount of gain you want to infuse into said chain and rock on ’till you can’t do it anymore. One great thing about the MXR M133 Micro Amp is the fact that it fits in no matter what application you have in mind. It even gives distortion pedals that additional girth. For a simple pedal that it is, Micro Amp is more than versatile. Best of all? It’s among the most affordable boost pedals whose performance can is worthy of that title. There is a reason why a lot of guitar players chose this exact model as their main choice for signal boosting. If you thought our previous pick defined the full spectrum of boost pedals, you have another thing coming. Xotic RC Booster is a boost stompbox of a very unique variety. You could go as far as to say that it’s a multi tool of sorts. 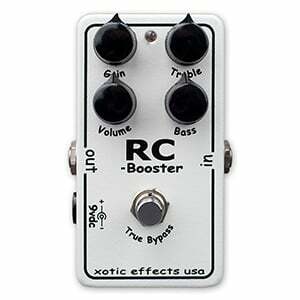 Instead of just giving you the ability to pump your signal chain with more boost, Xotic RC Booster takes the route of additional resistance. This awesome pedal allows you to select which part of the frequency range is going to be boosted. That is made possible thanks to a formidable three band EQ that is capable of applying your adjustments without affecting the timbre of the tone. That is the very definition of transparency in guitar effects. This complex nature means we are dealing with more than just a boost pedal. With a bit of creativity and some time on your hands, you can use this booster for a variety of purposes. All things considered, you could say that Xotic RC Booster represents the other end of the boost pedal spectrum where some pretty powerful beasts reside. When it comes to guitar effects pedals, Electro-Harmonix is one of the names you can trust to have your back, no matter what kind of sinful tone you are after. With that said, it’s no surprise that good old E-H produces one of the oldest and best boost pedals on the market. In terms of layout and design, it’s fairly similar to the MXR we covered above, only this one has a bad temper. There is only one knob to work with, and it is the Boost. When it comes to guitar effects pedals, Electro-Harmonix is one of the names you can trust to have your back, no matter what kind of sinful tone you are after. With that said, it’s no surprise that good old E-H produces one of the oldest and best boost pedals on the market. In terms of layout and design, it’s fairly similar to the MXR we covered above, only this one has a bad temper. There is only one knob to work with, and it is the Boost. Unlike other pedals of this specific type, Electro-Harmonix LPB-1 doesn’t only add volume and girth to your tone, it also pushes the amp into overdrive. As a matter of fact, the circuitry found in this model was the basis for some of the earliest overdrive pedals ever made. That is a lot of heritage packed in one stompobox that costs less than two large pizzas. Honestly, you would have to dig very deep to find one legitimate excuse why you don’t already have an LPB-1 on your pedalboard. Oh look, another Xotic model on our list. There’s not much we can say in our defense aside from that Xotic builds some of the best boosters out there. So what’s the difference between the EP and RC? Their principle of operation, for the most part. Xotic EP booster comes in the already familiar one-knob-wonder design. This slim black box of gain packs a mean punch when used straight out of the box. However, a closer inspection will reveal that there is a lot more going on below the surface than the eye can see, literally. This pedal comes with internal controls that allow you to adjust the amount of bass boost and the brightness of the effect. Sure, these controls aren’t really accessible on the fly, but just having that type of flexibility is rather refreshing when that gain knob becomes dull. What is this pedal good for? Just about anything boost-related. It’s fairly transparent and has a linear gain progression. This makes it great for a number of different applications. It all comes down to what you need to get done. The standard definition of this pedal includes both overdrive and boost as description tags, so adding it to our list feels a bit like cheating. However, the boost part of the equation is what we are interested in, and its goodness is exactly why Archer is here among the greats. The pedal itself is a pretty wicked combination of two somewhat close effects that work great when combined together. Using the J Rockett Audio Designs Archer is a blast, both in a metaphorical sense, and purely sonic sense. There is enough additional clean gain to pump up your cleans quite nicely while the overdrive portion takes you into the world of gritty sweetness. With that said, Archer is a perfect choice for those looking to get into boosters, but are a bit reluctant to commit to this type of pedal. This way you can have a good overdrive that stacks rather well against some of the best pedals of this type, and also allows you to fall back on it if boost effect is not something that really floats your boat. However, it’s not the cheapest pedal out there. That is a common theme with boutique designs, though. Another day, another awesome boost pedal with that single knob design. TC Electronic Spark Mini Booster took the already proven layout and spiced it up a little. In terms of raw performance, this little thing gets you a pretty good dB per dollar ratio. There is decent transparency with this effect, and it comes with true bypass. However, that’s not all it has to offer. TC Electronic decided to add another layer of functionality by introducing their PrimeTime feature. Despite its fancy name, and how much TC Electronics is trying to make a huge deal out of this, PrimeTime is actually a pretty simple thing. There’s a small switch below the gain knob which allows you to choose how the stomp switch is going to behave. In position one it acts just like any other stomp switch you’ve ever used. When you flip it to its second position, you drop the stompswitch from on/off mode to press-to-play mode. This comes in handy when you just want to boost short portions of the song. All in all, it’s not something every guitar player is going see as useful, but some will. Donner Boost Killer is one of those models that is mostly lurking in the shadows. Not a lot of people have tried it even though it’s on of the best aggressive boosters on the market. After all, that name is there for a reason. It comes with a bit more control, aside from your usual Gain knob. You have Bass and Treble EQ to work with, each capable of adding or detracting some 15 dB from the signal. 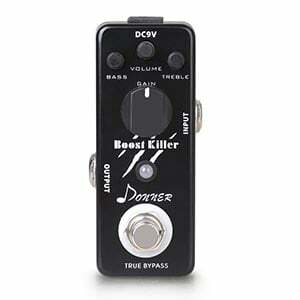 The first thing that comes to mind is compensating for limited amp EQ, but Donner Boost Killer also acts as a great natural overdrive. That type of performance is more in line with the modern application of boost pedals. The best thing about this booster is the price. It is dirt cheap, so much so that you have to wonder how Donner is even making a profit from selling these. However, we are definitely not complaining. If you want to experiment with decent boosters without dropping a lot of money on one, Donner Boost Killer is your best bet by far. Zvex is currently among the most popular boutique brands on the market. If you’re wondering why, one part of the answer lies within their brutal fuzz box which pretty much kick started the whole company. 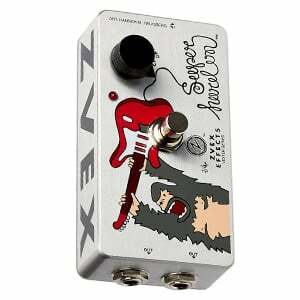 Ever since then, Zvex has been on a mission to bring us some of the most outrageous effects pedals no one else was willing to make. The defining feature of the Super Hard-On is the level of transparency this pedal brings to the table. We are talking marginal timber impact that is hardly going to be noticed even by the most experienced guitar players out there. This is predominantly a clean boost unit, but we all know what that really means. There’s an abundance of gain to be had, even though there are no special snowflake features to play with. Zvex was never a brand that was concerned too much with forcing various impractical bells and whistles on their custumers. They were asked to build a good booster, so they did just that. All while sticking to the original idea behind this type of effect. For some guitar players out there, boost pedals are about the same as alchemy. They are these mysterious stomp boxes that do something, but not many are sure what. Despite all that mystery, a boost pedal is a very simple device. The whole idea behind this type of ‘effect’ is to add more power to the signal, before that signal reaches an amplifier. But wait, you might say, don’t many other effects pedals do the same thing? They definitely do, but not in this way. If you’d like to learn more about distortion pedals, check out our guide dedicated to this effect. Here’s the thing. Boost pedals are meant to add more juice to the signal, but without affecting it any other way. That last part is super important. You can always add more gain with a decent distortion pedal, however that implies having that signal distorted. This inherent simplicity of boost pedals is exactly what keeps them out of the spotlight. They are essentially scalpels in a sea of sledgehammers, with a very niche purpose that many might benefit from, but only few actually need. It is fair to say that most guitar players who use boost pedals have quite a few years of experience under their belt. There are also some beginners who go head first into boosters, but that is fairly rare. In essence, we could summarize boost pedals as devices that unlock more of the tone you have already dialed in. For such a niche type of pedal, boost pedals have plenty of uses. The more you spend time with one, you will start to realize the true potential a boost pedal has to offer. In this next segment we will discuss different ways a boost pedals can be helpful in your every day life as a guitar player. Some of the ways might be obvious, but others not so much. Let’s get right into it. One of the most popular uses of a boost pedal is to add more girth to the already dialed in tone. Since transparency is imperative for a boost pedal to be any good, you can pretty much expect zero coloration as a result of using a boost pedal. This means that the only actual effect would be more gain and more power in the signal itself. In practical terms, you can make your overdrive sound far more organic than it does right now. It gains tangible width that can absolutely spice up the flavor. On a similar note, a bit of added boost does wonders for solo sections as well. No matter what kind of pedals or settings you are using for your solos, just pressing that foot switch on a booster will make those solos more attractive in numerous ways. It is really hard to explain, but try to imagine how a tube amp sounds on extremely low volume. You are hearing the notes, but they sound pretty hollow. Let’s say that this is your regular guitar tone. Compared to that, adding a boost pedal would be like pushing that amp into its optimal power band. In other words, it is still the same tone but it sounds full now. If we were to look at the nature of tube amplifiers, we would find that creating actual overdrive would imply pushing that amp past its optimal operating conditions. Those who own tube amplifiers know that not many things out there can replace the feeling of pushing a tube amp that hard. However, there are consequences. In some cases, in order to reach that fuzzy portion of tube’s power band, you have to crank the volume past comfortable levels. If you are using the amp at home, it doesn’t take much to figure out how this can be an issue. By adding a boost pedal into the signal chain, you are infusing all of that gain long before the signal reaches the amp. By doing so, you don’t have to crank the volume too much at all. This effect is more or less linear as you add volume. One of the less known uses for boost pedals is to solve hardware issues. Playing guitar on stage and using a complex pedalboard can be tough. You have to set everything up just right, and then activate the pedals as you play. However, there is one more issue you need to think about while you are up there. Cable length can prove to be deadly for your tone. The longer the guitar cables are, more power is necessary to keep the signal intact until it reaches the amplifier. With a boost pedal, you are pumping all that necessary power into the system, thus ensuring that your signal reaches the amp in perfect condition. While this scenario might sound far fetched for most of us, it’s necessary to remember that cables on professional stages can be over 20 feet long when you count in everything. Another form of hardware limitation has to do with pickups in different guitars. For example, a Stratocaster has a much different nominal volume than a Gibson SG. By hooking up a booster while using a Strat can easily push it to the same level of power as Gibson SG. Here’s where we reach a somewhat controversial part of the story. On paper, most boost pedals are completely transparent. In other words, they are marketed as pedals that have no impact on the nature of the tone aside from adding more power. In reality, boost pedals generally add some type of coloration to the tone. It might be miniscule, bit it is often there. With that said, it is somewhat deceptive to market pedals as clean boosts. The good thing is that this effect is in many cases reduced to a minimum. On the other hand, a good number of guitar players actually appreciate that tiny bit of discoloration. Especially considering that most people use boost pedals to drive a tube amplifier. Unlike most other guitar effects pedals, there are only two conditions that need to be met for a boost pedal to be deemed good. First one is its ability to offer significant gain boost, and the other is transparency. If you really want to nitpick it, we can count in a proper bypass switch as well. The first condition is arguably the easiest one to meet. Since boost pedals are essentially preamp stages packed into a pedal format, it’s not all that difficult to make one powerful enough. However, making a boost pedal transparent enough is where things get tough. Looking at some of the earliest boost pedals, we will see that the circuitry inside is incredibly simple. Simplicity is not something that is exclusive to older designs. There are plenty of simplistic boost pedals in circulation today. With that said, achieving proper transparency requires a far more complicated approach sometimes. Some of the most transparent boost pedals have extremely complex circuitry. At this point, designing a transparent circuit is truly bordering with alchemy. Having that true bypass is also important, especially if transparency isn’t on a high level. Without it, the pedal would add some coloration to the signal even when it was completely off. As you can imagine, that is not something you want to have. The byproduct of this search for ultimate transparency leads to fairly expensive boost pedals hitting the market. It is easy to understand why some guitar players are turned off by this. Boost pedals might perform a fairly simple task, but they are anything but simple under the hood. As awesome as EQ pedals are, they are definitely not something you want to use as a booster. The whole idea of using an EQ to add some gain comes from the fact that EQs have that ability. However, all of that additional boost is channeled through specific frequencies. Even if you were to push all sliders to the max, you wouldn’t get a nearly similar result due to the lack of, you guessed it, transparency. EQ pedals are there to add a bit of punch to specific portions of your frequency range, not all of it. Additionally, comparing the amount of additional gain a boost pedal offers to that of an EQ is unfair. Boosters are generally far more powerful. Since we are already talking about using other effects in place of a boost unit, it is worth mentioning that several other effects are somewhat similar as well. However, the reasons why they don’t work in this capacity are more or less the same. Among the large number of various boost pedals, there are also interesting hybrids in there. In most cases, you will see an overdrive being fused with a booster. That is most likely due to the fact that every overdrive, distortion and even fuzz has an integrated boost sections in there. As great as some of these hybrids are, they are limited in their performance as boosters. The moment you add a whole new function to the mix, retaining any kind of serious transparency becomes increasingly difficult. However, if all you want is something that will saturate your distortion or overdrive, a hybrid could be the perfect option. Using these pedals to enhance a clean channel is where you will probably run into real issues. Boost pedals are a very useful piece of kit, but one that you need to master. In order to properly use these pedals, you need to have a thorough understanding of what they do, but also of your gear. Once you get to that level, you’ll find that boost pedals are a true game changer. Models we have chosen for this purpose are easily some of the best in you can get. There will always be some obscure boutique designs that are incredible, but those also tend to come with exclusive prices. We went with proven value deals that work.